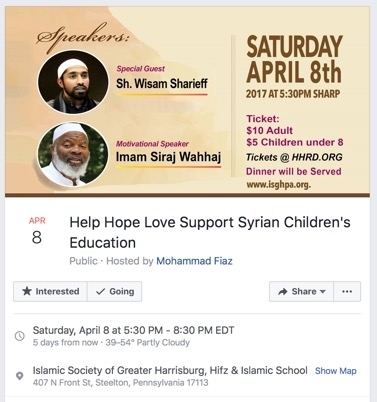 This Saturday, April 8, a fundraiser will take place for the terrorism-linked charity Helping Hand at the Islamic Society of Greater Harrisburg (ISGH). Among the advertised speakers is Imam Siraj Wahhaj, one of the most vocal defenders of Islamist violence and extremism in North America. See this profile of Wahhaj here at the Middle East Forum blog, which features both audio excerpts and transcriptions from his bigoted sermons. Some of Wahhaj's most disturbing statements include such calls to violence as "And you know, brothers and sisters, you know what the punishment is, if a man is found with another man? The Prophet Mohammad said the one who does it and the one to whom it is done to, kill them both." He is also an advocate of racial bigotry, saying in a sermon, "Take not into your intimacy those outside of your race. They will not fail to corrupt you." What is Helping Hand and how are they linked to Hamas? Founded in 2005, Helping Hand reported revenue of over $40 million in 2015. Some of this money has supported the Al-Khidmat Foundation, which is the charitable wing of Jamaat-e-Islami, a South-Asian Islamist movement whose leaders have recently been convicted by a Bangladeshi war crimes tribunal for mass murder and torture during the 1971 war of independence. In 2006 Al-Khidmat announced a donation of six million Rupees ($99,000) to the Palestinian terrorist organization, Hamas.